This county, established December 27, 1906, was previously the east part of Norman County. It comprises half the area of the White Earth Reservation, which also extends south into Becker County and east into Clearwater County, the name of the reservation as noted in the chapter for Becker County, being derived from White Earth Lake. The south line of Mahnomen County crosses the north end of this lake, and its outlet, the White Earth River, flows through the south half of this county to the Wild Rice River. The county seat of Mahnomen County has the same name, which was given to this railway village before the county was established. Its spelling here adopted is similar to Mahnomonee, written by Henry W. Longfellow in The Song of Hiawatha. 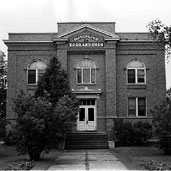 NOTE: Information of the origins and meanings of names in this county was received from Alfred Aamoth, auditor, and Arthur J. Andersen, treasurer, during a visit at Mahnomen, the county seat, in September 1909; and from John W. Carl, auditor, and Martin M. Bowman, clerk of the court, in a second visit there in September 1916. BEAULIEU Township and village were named for Henry and John Beaulieu, who served in the Civil War and afterward owned farms here. The village in section 31 was first established with the trading post of John H. Beaulieu in 1868; the post office began in 1891 with Lizzie Beaulieu, postmaster, changing to a rural route in 1960 and discontinuing in 1968. John Beaulieu was during many years the village postmaster. Records of the Beaulieu family and allied families, prominent in the history of the Ojibwe in this state, descendants of a French fur trader, Bazille Beaulieu, and his Ojibwe wife, Queen of the Skies, are given by Winchell in The Aborigines of Minnesota, page 722. During the 1890s a government boarding school for Indian children was built, closing in 1912. Webmaster's Note: Regarding the surname Beaulieu, I searched a French/English dictionary and there was no match for "Beaulieu." I divided the word in half, and found that "Beau" means "handsome" and "lieu" means "place." CHIEF Township was named in honor of May-sha-ke-ge-shig (also spelled Me-sha-ki-gi-zhig), a leader of the Ojibwe on the White Earth Reservation, described by Winchell as "a man revered for many noble qualities and for his distinguished presence." He died "nearly 100 years old," August 29, 1919, at the Old Folks Home in Beaulieu; he had lived as a farmer on this reservation since 1868. CLOVER Township, T. 145N, R. 39W. GREGORY was named for Joseph Gregory, an early farmer, who was one of the first taking an allotment of land in this township. HEIER Township commemorates Frank Heier, who was teacher of an Ojibwe school in this township and later was superintendent of the government school at Pine Point, Becker County, near the southeast corner of the White Earth Reservation. ISLAND LAKE Township has a large lake of this name, containing an island of many acres. LAGARDE Township was named for Moses Lagarde, who served in the Civil War, received a farm allotment here, and was owner of a hotel in Beaulieu village. LAKE GROVE Township is mostly a broadly undulating and rolling prairie but has several small lakes bordered with groves. A post office was located there, 1914-16. LITTLE ELBOW LAKE Township, also known as Little Elbow Township (T. 143N, R. 39W), dissolved in 1950, becoming part of the Unorganized Territory of Southeast Mahnomen. MAH KONCE, a village in sections 3 and 4 of Twin Lakes Township, which had a post office, 1924-30. SOUTHEAST MAHNOMEN, Unorganized Territory of, includes former Little Elbow Lake Township (T. 143N, R. 39W) and Twin Lakes Township (T. 144N, R. 39W). MARSH CREEK Township bears the name of the creek flowing across it. NAY-TAH-WAUSH, a village located in Twin Lakes Township, section 28, was first known by the name Twin Lakes; the name changed in 1906 to Nay-tah-wash, which means "smooth sailing." The site had several sawmills, stores, and government offices; its post office began in 1907 with Star Bad Boy, postmaster. OAKLAND Township, T. 143N, R. 40W. PEMBINA Township, like Pembina River and County in North Dakota, is named from the bush cranberry, excellent for making sauce and pies, called by the Ojibwe nepin ninan, "summer berry." The Ojibwe words were transformed into this name by the French voyageurs and traders. POPPLE GROVE Township has mainly a prairie surface, interspersed with occasional groves of the common small poplar, often mispronounced as in this name. ROSEDALE Township, consisting partly of prairie and partly of woodland, was named for its plentiful wild roses. SNIDER LAKE was possibly an early name for Little Elbow Township. It has a lake of this name, beside which Frank Schneider, a German married to an Ojibwe, formerly lived as a farmer but later removed to Waubun village. TWIN LAKES Township (T. 144N, R. 39W) is named for its two lakes, separated by a narrow strip of land with a road. It dissolved as a township in 1950, becoming part of Unorganized Territory of Southeast Mahnomen.